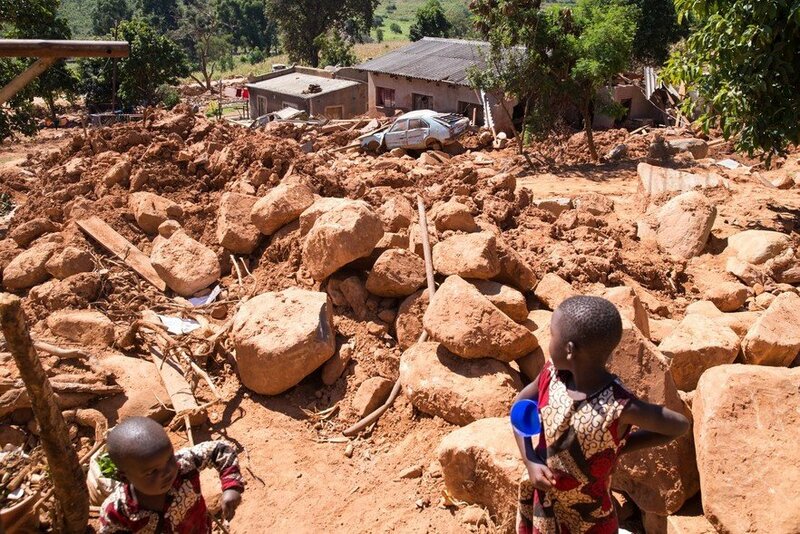 On March 15, Cyclone Idai slammed into the Chimanimani Mountains that form the border between Zimbabwe and Mozambique, GroundUp reported. Torrential rain and sustained winds of up to 190km per hour flattened the low-lying area between Beira in Mozambique and the Zimbabwean border. It set off landslides in the Zimbabwe highlands that have altered the landscape. Officials in Zimbabwe estimate that more than 2 250 houses were washed away or damaged, leaving more than 4 000 people displaced. Entire sections of settlements have completely disappeared, with massive rocks where houses had stood. The bodies of their occupants were washed away into Mozambique by the floodwaters. Cyclone Idai swept through Mozambique and into Eastern Zimbabwe. The photos in this story are from Eastern Zimbabwe in the area Mutare in the north of the map to Chipinge in the south. The map is from OpenStreetMap. Rocks and mud now rest where houses used to stand and families used to live in Ngangu, a high-density area in Chimanimani. Surviving residents described the noise of the cyclone as deafening thunder, or compared it to the sound of a helicopter landing. Losses in Ngangu itself are unknown, but residents said 49 people from Ngangu were buried in the local cemetery and Chimanimani Heroes Acre. It took three days before the first help arrived. More than 30 new graves have been dug in Heroes Acre in Chimanimani for the dead from Ngangu and other Chimanimani settlements. Residents said graves hold two bodies, sometimes even three. Blessing Matambo came to work on Mzvuzvu Bangedzai’s six-hectare plot of land outside Biriri three weeks ago, after crops were destroyed by flooding and equipment washed away. Bangedzai said 70% of the maize crop, which was ready to harvest, was destroyed. Avocado, lemon and banana trees were also swept away, along with his irrigation system and piping. Displaced residents wait for aid at a government run checkpoint in Chimanimani. The aid package consists of blankets, maize meal, oil and sugar, as well as candles and soap. Residents seeking aid, many of whom are mothers with young children, start gathering in the morning and wait hours before the packages are distributed in the late afternoon. Children at Mashonjowa primary school, which served as the first aid depot in the wake of the cyclone, rush to be photographed as they celebrate the last day of school before the Easter break. Lynne James, who was involved in co-ordinating relief efforts, said the children would sing the national anthem in the morning and everyone, including the helicopter pilots, would stop their activities until the anthem ended. Displaced children being housed at the Chimanimani Hotel crowd around a laptop on a rainy day and watch a Spaghetti Western for entertainment. Chester Dube, a local farmer who took charge of organising the housing of displaced families at the hotel, said now that food and medical aid had been provided, they were in need of a projector or big screen television, and books and pens, to provide children with an escape from the trauma they had lived through. Jane High, who runs the Chimanimani Tourist Association, feeds a group of semi-feral cats next to her lodge, the Frog and Fern. High set the tourist association offices up as an aid receiving depot and ensured it got into the right hands. She also put the local mountain guides and soccer team she leads to work, taking food over the mountain to an isolated household headed by a disabled teenager. Flood waters rising into Copa village carried this section of a bridge 500m downstream. The boulders surrounding it were also washed down, and now cover land where there were houses and crops. Surviving residents estimate more than 200 people were killed, their bodies washed into Mozambique. Only one body, which was photographed by Mozambique authorities, has been identified. As of April 7, Unicef estimated that there were 344 deaths in Zimbabwe and 257 people missing from the cyclone. In Mozambique, more than 500 people died and thousands remain missing.